Go here to browse through our extensive collection of available used flutes at your leisure. Only the best quality at Dagan Flute Atelier. Look no further for the most beautiful collection of available Burkart Piccolos; available at the absolute flute expert of Amstelveen; Dagan Flute Atelier. Do you have the music in you? Visit our music room and hear the crystal-clear tones produced by our flutes. Only at Dagan Flute Atelier. All our burkart piccolos prices are equal to the tax-free burkart factory price (usa) + 5% import- and customs costs to the Netherlands. 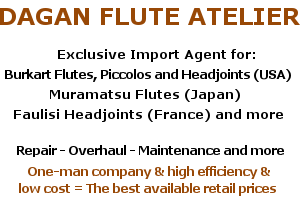 An Amsterdam based company established in 1988, Dagan Flute Atelier operates in sale, repair, import & trade of silver-plated, silver and gold flutes. Our expertises include Muramatsu flutes and Burkart flutes and piccolos.